Hello friends. It has been a long time, hasn't it? I find myself laughing at the fact that I've tried to abandon Spark on several occasions only to be drawn back into it at some point. I'm not sure why I thought I'd be better off on my own... ego perhaps, or maybe even wishful thinking... but I'm not. Spark has an amazing community of like-minded individuals who are all striving to become healthier. Why not just embrace that? Well, it's what I am here to do this time. Embrace it. I've literally done it all... the diets, the exercise... and it's worked, because I've done things to the extreme. I have yet to achieve balance in all of this, but I am going to aim at that goal this time. What brought me back was a myriad of reasons... thinking about it quite a bit, coupled with the fact I see several of my friends who are achieving wonderful weight loss (albeit not by ways I'm willing to try and obtain the same success again) and sent over the edge by a friend telling me that she is going to get gastric bypass at the end of the year. Hearing that was a blend of jealousy surging through my veins imagining the quick ROI with a healthy dash of knowing that isn't going to solve the actual problem. It's a complicated love/hate relationship I have with (what I consider) the easy way out. I've belonged to a fitness studio for the last year... which I haven't really used at all. It's been an abhorrent waste of my money, and yet I stay a member. Now? Now I went and joined another gym... one that has the cardio and alternative classes that I am looking for. My goal is to get a routine together that I can focus on so my life has some predictability again. Turns out NOTHING to do isn't good for me. At all. What I do know is that I already have the tools and knowledge to apply myself. I don't need to be hand held. I don't want to be hand held. I want to get in, do it, and get out to live my life... the best life I can build for myself. What's not worked in the past is incessantly counting calories and weighing myself (most likely a blessing that my scale won't cooperate because it needs new batteries). That brought on a lot of self-hatred. This time, I'm going to focus on eating healthy foods and portions, getting in movement, and only working to weigh myself once a month. If I try, I can gain 10 pounds in a weekend so there isn't any real reason to beat myself up on a weekly basis. Welcome back! It is good to see you here and posting again! I'm still here, trucking along, even though the setbacks have outnumbered the victories lately. I'm not on here as much as I should be though, considering I know how important the support here is. Anyway, I'm glad you're back! I've, but have fallen into a cycling habit again and was JUST wondering how you were doing today when I saw a new blog post! Squeeeee! 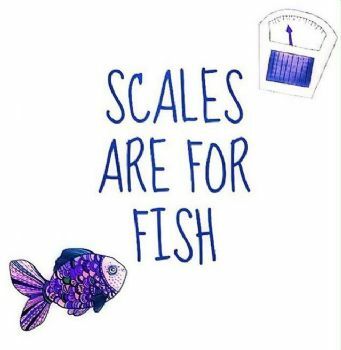 Scales are for fish ... I will have to try that on my husband! I sure hope that the gastric bypass works for your friend. My impression of the way of eating that one has to do after gastric bypass surgery is essentially what Spark recommends, with the added complication of getting physically ill if a person strays from the plan. I guess that means that there is built in "willpower". I have been following the blogs of a couple Spark members who have recently had bypass surgery and they both mentioned that it is extremely painful. With it being major surgery, it doesn't seem the easy way out to me. I think your plan to eat healthy foods and PORTIONS (emphasis mine) and getting in movement is a much more healthy approach and one that treats your body better. You know I wish you all the best on your journey to better health. Hey friend!! Nice to see you here, too. Yep... Spark and the flow of info and community is a big support and ...hmmm... a CURRENT in my stream.... helps me keep swimming in the right direction. Much to celebrate... near mid and far distance.